On 4 April the Swiss Federal Office of Transport (BAV) has issued the operating licence for Stadler’s new high-speed train, the EC250 / Giruno. Stadler’s client for this train is the SBB – Swiss Federal Railways. The BAV has granted permission for the high-speed train to run at 200km/h on the Swiss rail network in single configuration. This is another step towards the successful deployment of the Gotthard train on the Swiss rail network. The SBB has announced it will gradually begin operating the Giruno starting in early summer 2019. 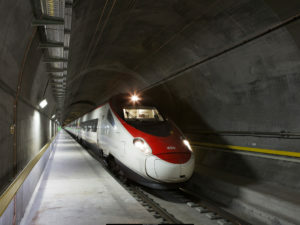 It will initially connect Basel and Zurich with Milan via the Gotthard Base Tunnel. There are further plans for this high-speed train to connect Switzerland with Germany in the future. When quizzed about why the SBB ordered a train capable of running at 250km/h when the permitted speed in Switzerland is only 200km/h, SBB said that this train will also operate in Germany and Italy where higher speeds are permitted. The SBB also says it is thinking long-term as it plans to have the Giruno in service for 40 years. It wants to keep its options open for the future. The Giruno has passed all project milestones successfully to date. Since April 2017 several hundred test drives have taken place in the four countries where the high-speed train will operate: Switzerland, Italy, Germany and Austria. In its single configuration the Giruno is 200m long and comprises 11 cars. In its double configuration it has a length of 400m with 810 seats. Uniquely for high-speed trains, the Giruno is low-floor – based on Stadler’s FLIRT trains. They can accommodate the different platform heights in Switzerland, Austria and Italy (55cm) and Germany (76cm). This is a premiere for SBB for a single-storey multiple unit. The SBB is proud that this train exceeds the legal requirements for accessibility. For example, it possesses more than twice as many wheelchair spaces and toilets than the law demands. Beyond that these trains boast high levels of comfort. They benefit from good mobile phone reception along the route and all seats come with power sockets. There is plenty of luggage space and the interior features a modern lighting concept using energy-saving LEDs. Quite generally, the interior design is spacious and bright. There are separate toilets for men and women. The Gotthard Base Tunnel – the longest railway tunnel in the world – has been in operation since 2016. By the end of 2020 the Ceneri Base Tunnel will complete the flat rail link through the Alps. The SBB therefore expects an increase in demand and has ordered a further 29 eleven-car multiple units from Stadler with options for up to 92 additional trains. All of them will have top operating speeds of 250km/h. Stadler signed the initial contract with SBB in October 2014. Following that it developed and built the Giruno in just 23 months. The first train went into service just three months later. The public got to see it for the first time at InnoTrans 2016. The SBB chose the name ‘Giruno’ for its new high-speed train. It comes from the word ‘girùn’ in the Romansh language, which is spoken in southeast Switzerland. It means ‘buzzard’. Until 2017 Stadler called it the EC250 (EC = EuroCity; 250 refers to its maximum speed of 250km/h). Stadler then renamed it ‘SMILE’ (from Schneller Mehrsystemfähiger Innovativer Leichter Expresszug = speedy, multi-system, innovative, lightweight express train).